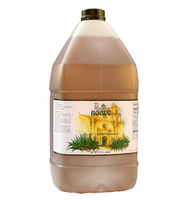 Raw Organic Agave Nectar Amber Light Premium Super 1 gallon (NET WT 12 lbs. / 192 oz.) $0.15 per Oz. *Our Premium Light Amber has a pleasant light flavor. Excellent when used to sweeten drinks such as fresh lemonade. Value Price!